The conference was a UDI-dedicated networking and learning meeting for device manufacturers and healthcare providers. The focus was on how they can support each other to benefit the patients. 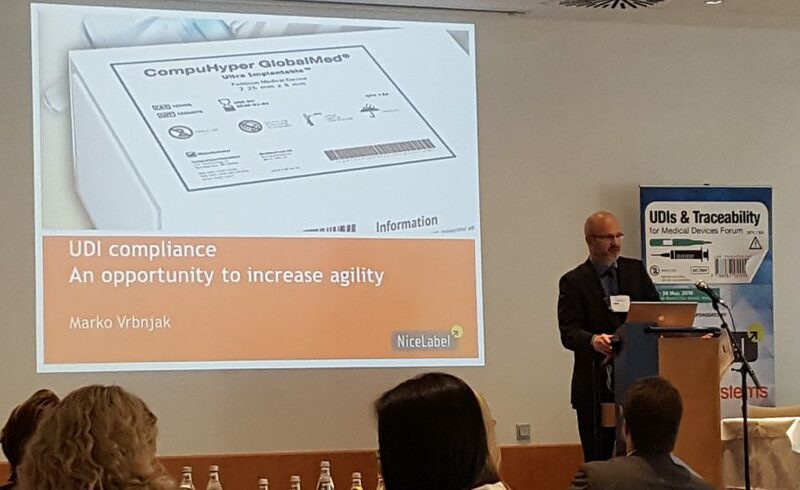 I recently attended and presented at the UDIs & Traceability for Medical Devices Forum in Munich. A prominent theme at the event was technology and how compliance to UDI and other regulations can be simplified by technological improvements that, in turn, will benefit patients. The conference made me realize that the life sciences sector can make a huge leap into the future by embracing new technology and tools. When I discussed the meeting with a colleague, he compared the situation with many African countries that have skipped using landline phones and desktop computers and jumped on the technology bandwagon with tablets, smartphones and 4G networks. At the beginning of the conference, many delegates considered UDI a burden – a new layer of unnecessary bureaucracy. Then people from hospitals joined the conversation. They said that they are the ones that need the data – they said, “We need all of it in order to make the right decisions and to get our supply chains in order.” Patient safety will improve a lot when doctors and nurses can easily access all product attributes as this will mean fewer mistakes at the hospital. The manufacturers need to think about the end user – if a nurse cannot quickly see the expiration date, she might end up using products that are expired. Listening to people from the hospitals was the tipping point for the delegates. The medical device manufacturers at the conference started to understand how UDI can make a difference. However, hospitals are not yet ready to transition to new technology. Someone from the audience asked if they are still in the Stone Age and the answer was, “Yes.” One of the challenges is that hospital supply chains are very complex. An attendee gave an example about a warehouse where employees pick whatever product they need without using any sort of system. There are many stakeholders involved in UDI compliance efforts and in order to fully reap the benefits, everyone will need to modernize legacy systems and processes. I have had conversations with many doctors in different parts of the world and I still find it astonishing that even in the most developed countries, the IT support in healthcare is so poor. The good news is that they are improving. The English NHS (National Health Service) now recommends that suppliers use GS1 standards, which is contributing to improved supply chain management. It‘s not rocket science, but it saves money and streamlines processes, while, most importantly, improving patient care. There is, however, no doubt that health care providers benefit from UDI and that is the main reason for manufacturers to move forward with getting compliant. Data management emerged as the key obstacle to compliance at the conference. The delegates had the opportunity to choose between three round tables and almost everybody chose the Master Data Management table, which I also joined. Many manufacturers are not well organized yet. Their data is housed in various software systems and Excel files. UDI requires manufacturers to submit several attributes of their products to the GUDID and most companies still have issues finding all the data and compiling it into one system. In order to address inadequate data management as part of UDI compliance, manufacturers must choose between short-term solutions and a comprehensive approach where they modernize their tools and processes in order to create growth. Listening to the delegates confirmed to me that for many medical device manufacturers, UDI is not a one-off project. They understand the larger impact and have a vision for operational improvement. Manufacturers that take advantage of the opportunity to get their systems and processes in order and adopt the latest technologies will create a substantial long-term competitive advantage. Abbott and Merck presented case studies and explained how they had overcome data management issues. Someone from another big manufacturer also noted that they have the resources to overcome the extra bureaucracy and requirements associated with launching a new product. But what about start-ups? An attendee from a smaller company pointed out that the complex and often conflicting international regulatory requirements present a huge barrier to entry for start-ups who don’t have the resources to deal with this level of complexity. There is no doubt that going forward, the early adopters, both large and small, will embrace the new generation of technology and use it to create growth. Device manufacturers that are falling behind on UDI and traceability will also see lower growth rates. While the September 24th deadline from the FDA is very clear, the European regulatory landscape is muddier. The terms are more or less agreed upon and are likely to be confirmed within six months. While there will be some similarities to the FDA’s ruling, there will also be some differences. For example, the requirements will not be harmonized across the member states and, when it comes to submitting data, Europe will not use the GUDID database. The conference made me realize that globalization is a big issue. Complying in the U.S. is one thing, but Europe has almost 30 languages, which adds another layer of complexity. Writing instructions for use (IFUs), labeling and keeping databases up to date will be a huge task. I believe some manufacturers are sticking to old processes and tools because they fear the risk that often comes with change. Pairing legacy tools with manual operations using paper based tools and processes to ensure quality and compliance is very costly and time consuming. As part of my presentation at the forum, I challenged the perception that change is risky. To quote Tom Peters, management guru and author of “In Search of Excellence”, “Almost all quality improvement comes via simplification of design, manufacturing…layout, processes, and procedures.” Replacing legacy tools as part of a compliance effort will allow manufacturers to grow faster with less risk. Just like the East African countries that move faster because they skipped landlines.